When it comes to forced induction, Deed's Performance has thousands of hard to find parts plus the knowledge and experience to make them work. We stock thousands of high quality name brand parts from most of the worlds leading manufactures and strive to offer the best products available, at the best possible price. Whether you are looking for performance on the street or at the strip, Deeds Performance offers unsurpassed tuning knowledge of today's most popular OEM and aftermarket engine management systems. 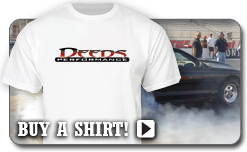 From streetcars to turn key racecars, Deeds Performance is the source for all your high performance project needs.